KUALA LUMPUR: Sheikh Salman bin Ebrahim Al Khalifa was re-elected unopposed to the position as president of the Asian Football Confederation yesterday after the regional body’s congress confirmed a new four-year term for the Bahraini by acclamation. The 53-year-old, who was not present at the meeting due to the death of his mother earlier in the week, was handed a third term at the helm after his rivals, Mohammed Al Romaithi from the United Arab Emirates and Qatari Saoud Al Mohannadi, withdrew. Sheikh Salman will extend his reign as president until at least 2023, by which time he will have completed a 10-year spell in charge of the 47-member body after initially completing the truncated term of former president Mohammed bin Hammam. He took over for the last two years of Bin Hammam’s stint as AFC president after the Qatari was banned for life by governing body FIFA from all football activities for his involvement in a corruption scandal. A member of the Bahrian royal family, Sheikh Salman first came to prominence in footballing circles in 2009 when he faced off against Bin Hammam for a seat on FIFA’s decision making body, a ballot he lost by a single vote. However, he won the presidential election in 2013 and was returned unopposed in 2015 before running unsuccessfully against Gianni Infantino for the position of FIFA president the following year. Initially elected on a platform of accountability, he has becoming increasingly distant during his presidency, rarely taking questions from the media since winning his second term of office. The former Bahrain Football Association president has denied accusations he was involved in human rights abuses by the Gulf state’s ruling family during a crackdown on democracy protesters in 2011. The agreement with Chinese-backed company DDMC Fortis will ensure revenues more than double from those under the current agreement with long-term partner Lagardere Sports. 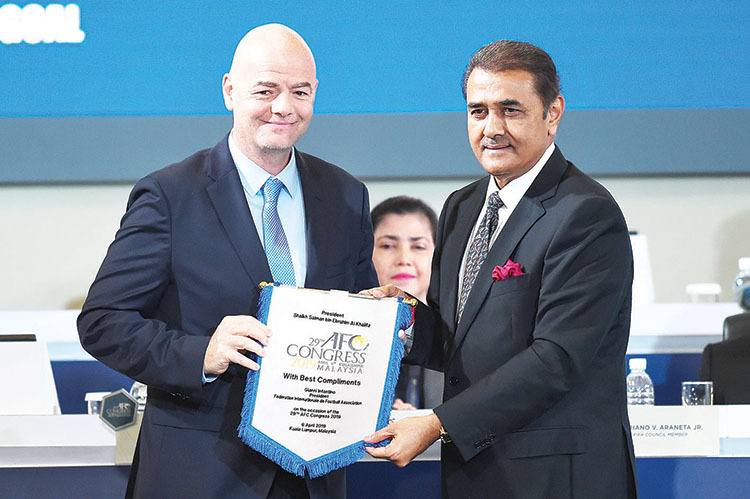 Meanwhile, India set their sights on qualifying for the 2026 World Cup as Praful Patel became their first representative on the powerful FIFA Council yesterday. Patel, one of six Asian delegates elected to the Council at the Asian Football Confederation Congress, said the World Cup was the next big step for India after making great strides in recent years.